Barracuda Lake has always been an enigma to adventure seeking tourists for decades. 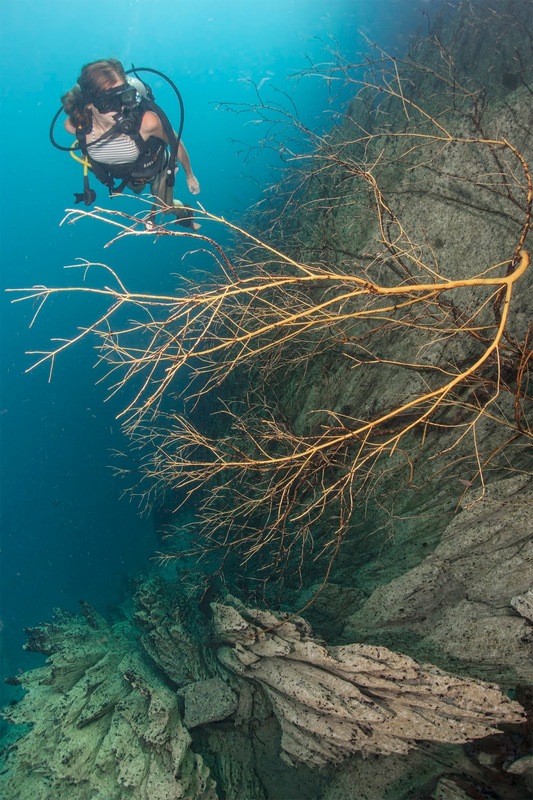 It's literally and figuratively diving immense picturesque canyons within a lake which starts as brackish water from the shallows and gets much saltier and a tad warmer once you dive beyond 14 meters. Scuba divers need to work a bit harder by carrying their dive gear 150 steps into the lake but will be rewarded with better vantage points from beneath the mysterious surreal lake holding a host of surprises. Getting there is quite easy, it's but a 20 minute banka ride from the Coron town pier and 150 steps will get you inside the lake. (there is a marine park fee of P200 per head). It can really get crowded as snorkelers, free divers and scuba divers gather at the entrance but once you dive in, it takes you to an underwater sojourn like no other. While some might argue there is seemingly no marine life within the lake, the immense canyons within the lake will keep you more than entertained plus if you inspect the walls more closely, there is actually an interesting amount of biodiversity where juvenile catfish, various shrimps and freshwater gobies abound plus a resident great barracuda is on the prowl within the lake (no silly incidents for decades, makes you wonder what it's food source is though). 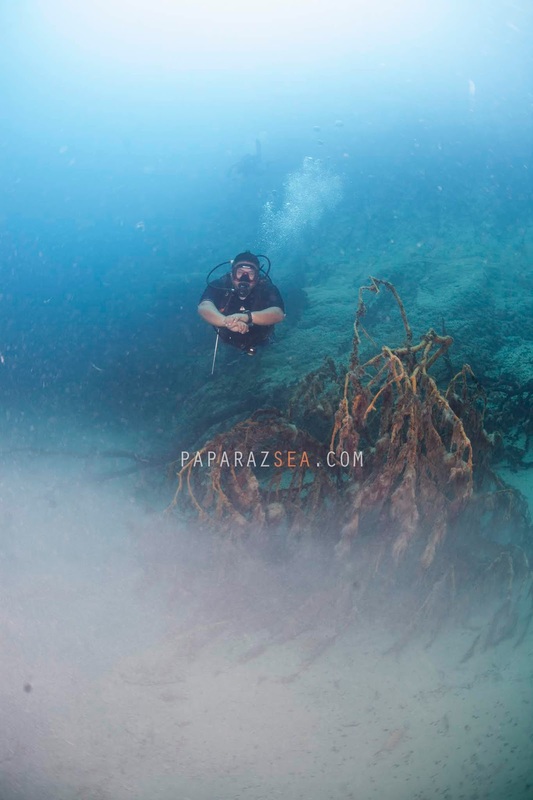 The visibility at Barracuda Lake stretches like forever. This is one of the few dives I did in my lifetime where from 25 meters, I can clearly see in detail cloud formations looking upward, despite the immense depth we were in. The lake has several wooden planks by the deep end of the jetty entrance where you can play with with your buddies. 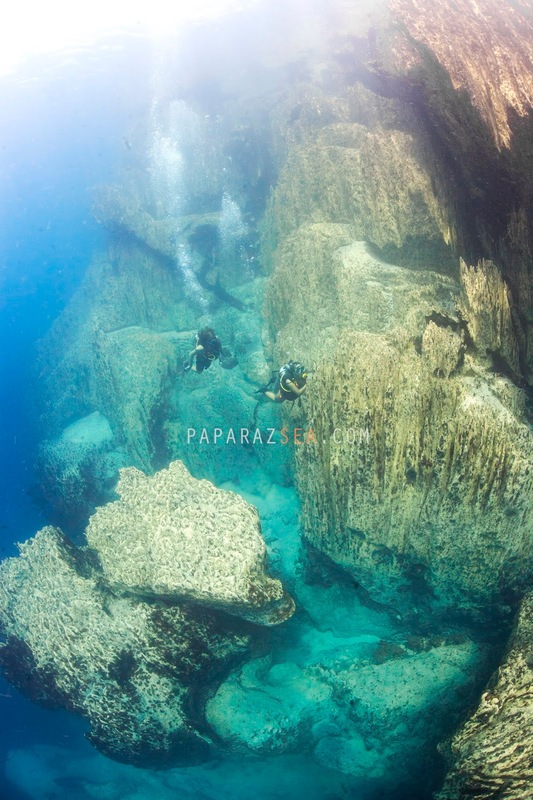 At this depth, water starts to get really warm and sometimes, you will visually see the thermocline dividing brackish and salt. Rainwater has filled the lake for decades and you can observe several submerged trees as you dive further from the jetty, evidence of a different world prior becoming the lake that it is today. 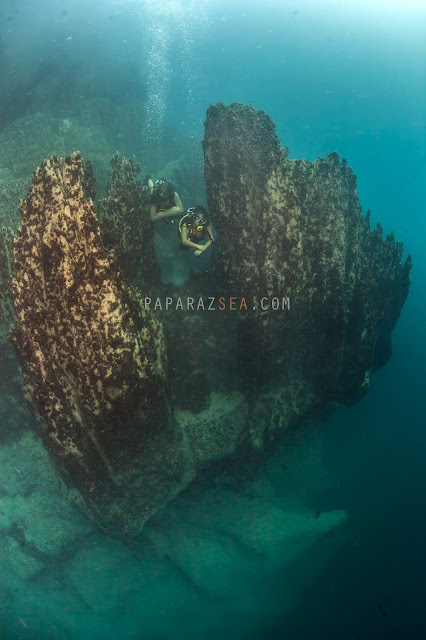 In terms of Underwater Photography, Sunlight will light up the right side of the lake while the afternoon sun will provide great light left side of the lake from the jetty entrance, both yielding different wall and canyon formations. Here is to the right hand side of the lake from the jetty entrance where you could visually see the change in water salinity, dive a bit deeper and literally sweat while diving. We were quite fortunate that one late afternoon diving there, the alleged lone great barracuda decided to make an appearance (wasn't an urban legend after all) and did several close fly by's with our students who happened to become merry group of Barracuda lake explorers. 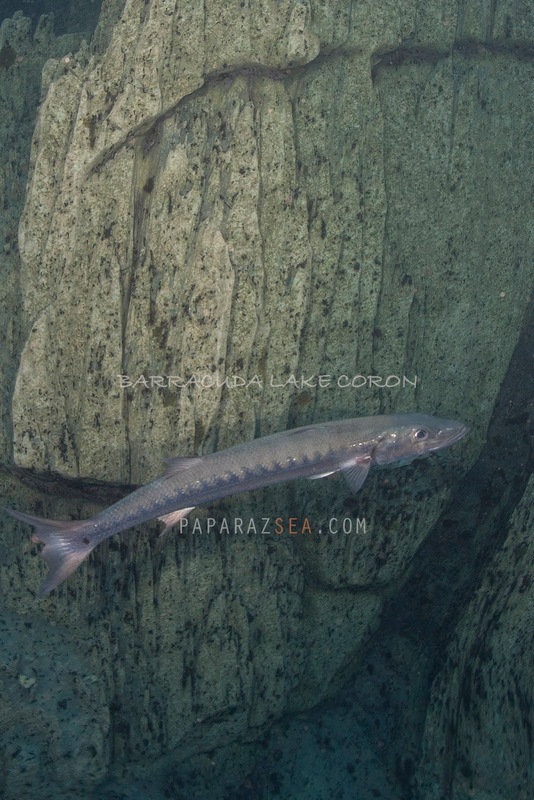 Barracuda lake does have a lone resident Barracuda for many decades now. Some veteran instructors share there were two a few years back. Interesting how the Barracuda survives in a brackish water environment and makes you wonder what their primary food source is. 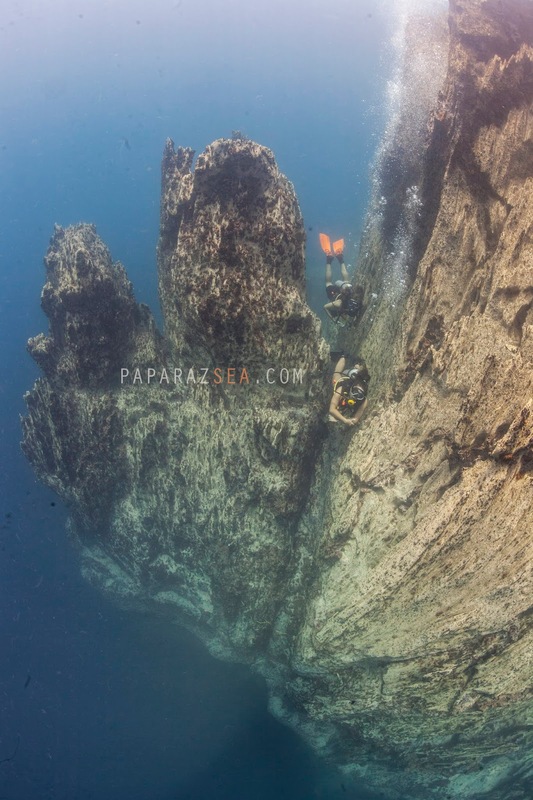 In Summary, If you like epic views and breathtaking canyon sceneries minus having to climb for hours or days to reach a summit for great views, Barracuda lake offers a unique experience of weightless spelunking within a bizarre yet captivating world of wonder. 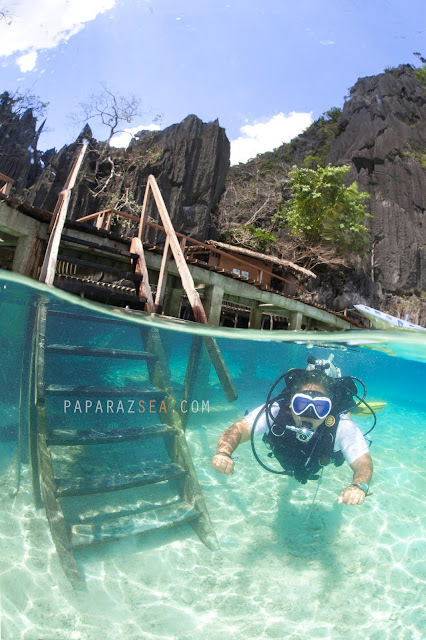 Thanks to Nikko Santos and Sea Dive Resort Palawan for taking us there. 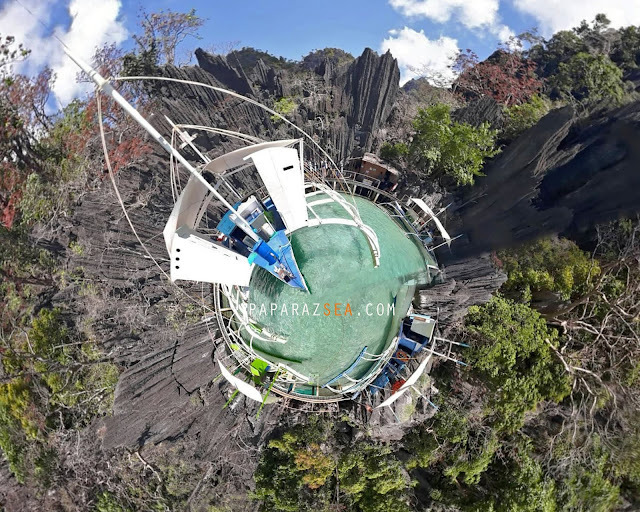 Getting here from Manila, two ways, One is by air where Cebu Pacific, Philippine Airlines and Sky scanner airlines offer daily trips here or there is a 16 hour ferry option from Manila port via 2go or Atienza shipping lines. There will be an abundance of travel agencies and dive shops to get you on a joiners trip or you can do a custom trip if you're traveling with a big group.